Welcome to the queen city of the south- The premier center of trade, information, technology, commerce and industry and of course a bliss of people and cultures in the Visayas and Mindanao. You're in line for a heartbeat of living, south side of the Philippines that's fast paced yet simple, sophisticated but practical. Breath and eat life at your own pace and pleasure- The true blue Cebuano way of living. 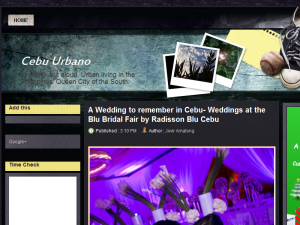 This what your Cebu Urbano Blog Ad will look like to visitors! Of course you will want to use keywords and ad targeting to get the most out of your ad campaign! So purchase an ad space today before there all gone! If you are the owner of Cebu Urbano, or someone who enjoys this blog why not upgrade it to a Featured Listing or Permanent Listing?